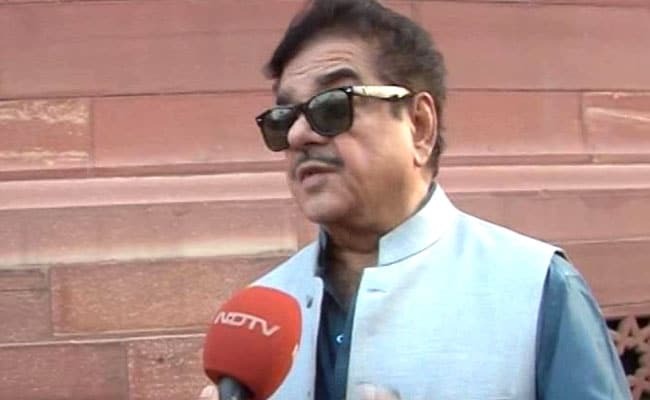 Shatrughan Sinha said the BJP can increase its seats by staying united and should not take the elections lightly. Shatrughan Sinha said he is often told that he may lose ticket for the next general election. New Delhi: There is anger among people over GST and demonetisation, and the writing on the wall is clear that the Gujarat assembly election is not just a 'chunav' (poll) for the BJP but also a 'chunauti' (challenge), party lawmaker Shatrughan Sinha said on Wednesday. Sharing dais with Congress leader Manish Tewari at a panel discussion on the latter's book 'Tidings of Troubled Times', Mr Sinha also defended his comments on economic issues, saying "if a lawyer can talk about finances, if a TV actress can be the HRD minister and if a 'chaiwala' can be... then why I cannot talk about economy?" His remarks were an obvious reference to Finance Minister Arun Jaitley, Information and Broadcasting Minister Smriti Irani, who was earlier HRD minister, and Prime Minister Narendra Modi. However, he did not name any of them. "From the writing on the wall and anger among people over GST, demonetisation, unemployment...seeing it, I don't want to say how many seats the BJP will get but certainly this election is going to be a special challenge," he said. However, the Member of Parliament from Patna Sahib said the BJP can increase its seats by staying united and should not take the elections lightly. "I will only say the matter is serious and this is not chunav (election), but chunauti (challenge)," he said. Without naming anyone, Mr Sinha said he is often told that he may lose ticket for the next general election. Asked if he could join any other political party, the former actor responded with his signature dialogue "khamosh (keep quiet)".